Our desire for love can drive us to rationalize just about any behavior. God made us to experience love. So when we don’t experience it, we know something is deeply wrong. Something is deeply wrong — our suffering is genuine. We do need to keep crying out for love, otherwise we will won’t be able to receive it. As intolerable as being unloved is, if we lose sight of where love comes from, we will ultimately destroy our relationships. We can submit and surrender ourselves to anything, treating it as a source. Some sources are life-giving and some are life-stealing. Most of our sources will fail us in one way or another. They may be excellent sources with natural limits, or they may be horrible substitutes for fullness of life. God is the only true and trustworthy source that will never run out or fail us. If you are struggling in your marriage, could you be expecting your partner to be your source instead of God? Are you trying to be sufficient apart from abiding in Jesus? Then the eyes of both were opened, and they knew that they were naked. And they sewed fig leaves together and made themselves loincloths. And they heard the sound of the LORD God walking in the garden in the cool of the day, and the man and his wife hid themselves from the presence of the LORD God among the trees of the garden. I will greatly increase your pains in childbearing; with pain you will give birth to children. Cursed is the ground because of you; through painful toil you will eat of it all the days of your life. God told Adam, “You will die when you eat of the tree of the knowledge of good and evil” (Genesis 2:17). Then God created Eve. God or Adam must have told Eve because she knew at least a distorted version of God’s command (Genesis 3:3). Adam and Eve lost paradise when they chose to trust in themselves over dependence upon God. When they disobeyed Him, they died spiritually and lost their secure connection with Him. Encountering fear and shame for the first time must have been brutal. Preoccupied with grief, they were unaware of the depth of the problem. Little did they realize they were powerless to undo the mess they had gotten into. You are probably thinking, “Awesome! Only four steps! I can be done next week.” But God made marriage to last a lifetime for a reason. The steps I am about to show you are real steps that we all go through at one time or another. But first, read Matthew 13:3-9. Jesus uses the Parable of the Sower to speak about our receptivity to God’s words. Let’s consider how the parable also applies to marriage. 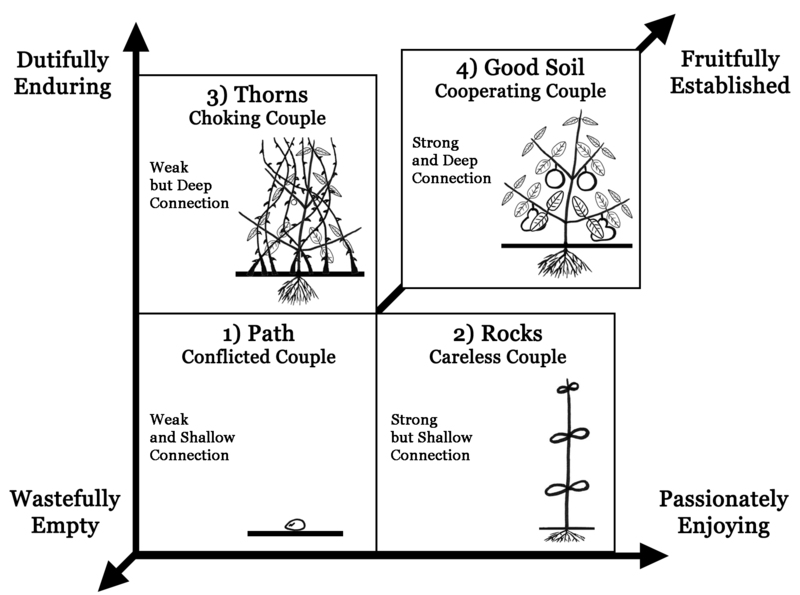 The four types of soil in the parable match up with four types of relationships. From least to most desirable, these are Path, Rocks, Thorns, and Good Soil. The typical inexperienced couple begins as either Conflicted or Careless. Along the way, every couple experiences being Conflicted, Careless, and Choking before making it to Cooperating. The Conflicted Couple needs to learn how to experience a basic positive connection. The Careless Couple needs to experience and resolve conflict to build endurance. The Choking Couple needs to find a deeper enjoyment amidst the busyness of life. The Cooperating Couple needs to refine and maintain what they’ve accomplished so far. As no person is perfect, no marriage is perfect. No matter which soil condition most closely describes your relationship, you can decide to grow a godly marriage by cultivating the path, clearing out the rocks, pulling out the thorns, and planting in the good soil. When you do this, you will be well on your way to yielding fruit one hundred times what was sown. While there are no specific steps to take to change, there are specific steps to position yourself for optimal change. There is a difference between knowing facts and experiencing the facts in a loving relationship with Christ. Knowing the facts does not change you. It is only head knowledge. But it is an important step. Before we open ourselves up to something, we need to know what we are opening ourselves up to. We live in a fallen world, so there are distractions that can block our ability to see and hear from Christ. So the next step in the process is to intentionally remove as many of these distractions as possible. Think in terms of all of your senses. Remove clutter that is visually displeasing. Remove noise. Remove smells. Remove temptations. With negatives removed, add positives. Go to a scenic, peaceful place. Or, if this is not practicle, imagine a peaceful place where you feel safe. You might light a scented candle. You could put on some soothing music. Consider anything that helps you relax. You may now be ready physically, but not spiritually. Say a simple prayer to give Jesus permission to be present and share with you what He knows is needed. Search your heart – be prepared to share what you find there. Whatever you find in your heart, bring it to God through your feelings. Even if you have negative feelings about God – He wants to hear those too. Come as you are. If you do experience persistant anger or other negative feelings about God, make a note of these for a later time. Consider counseling to sort through these feelings. At this point, you have done all you can do, except to wait with anticipation. Believe God wants to speak to you. Again, if you do not believe this, make a note of it so you can dig deeper into why. It might help to remember step one. Think of some scriptures that affirms God accepts you and wants to speak to you. Come to God in faith believing these are true. Allow God to speak to you. What you start thinking about is likely not a coincidence. Trust God is directing your thoughts. Allow your mind and heart to be a blank canvas and give Jesus permission to write and draw on your heart. What negative feelings or memories came up when you thought about God? How did God speak to you? Consider keep a prayer journal where you write out what God is saying to you. Forgiveness is hard work. It is especially hard to forgive when you are still living with the effects of an offense. Yet, there can be an even worse place to be. When you are the offender, you have to live with something irreversible you did to someone else. What if you feel blocked from experiencing true forgiveness for what you have done? These four steps will help you forgive yourself. It is important to look at what has happened. This is the same as the first step in forgiving others. Identify how reality is different – what could have been? Identify what is lost as a result of your actions. Accept responsibility for what you did. Initially this may be hard to do and you may actually feel worse. But it is a necessary step because there is no going back to the past to undo something, there is only moving forward. It is appropriate to feel sorrow or remorse for a short period of time. This is an essential part of handling a loss. Even if the primary loss was someone else’s, you have lost something too. Until you can forgive yourself, you will lack some degree of security. Spend some time being aware of your feelings. Express feeling sorry for what you have done. This could be journaling, talking, or perhaps even yelling or some other method to expend your energy (all of this done without hurting anyone). Accept what was lost as lost. Spent an appropriate amount of time grieving. This might be anywhere from a couple of days to a couple of months. Surrender your fate into God’s hands. Ask God to forgive you. Trust in God’s grace and mercy for both the offended and for you. Trust that God is able to make up for your mistake in a way that only God knows is best. Pray for the person you offended. Pray that God will bring them to a better place than before you hurt them. Even if this is not God’s will, this is a good heart attitude. The offended will not be able to return to their pre-offense state, but God will make it right. God may bless the offended person sooner, or the offended person may continue to suffer for some time. Either way pray that the offended can sense God’s presence and find peace and acceptance of their new reality. If God does not appear to make up for your mistake, trust that God is in control and knows something you do not. Be willing to be a part of God making it right. Make restitution if possible (but only if the offended wants this). Having done what you can do to make restitution, leave the rest to God. Drop the weight. Cut the strings. Leave the luggage. Stop punishing yourself. Walk away from it. Allow yourself to pursue enjoying your life again. Get on with your life. Rejoice that you are forgiven. Having learned from your mistake, be a blessing to others. Be ready to forgive others in the same way you have received God’s forgiveness. If you continue to struggle to forgive yourself, realize you have not fully received God’s forgiveness. Return to the gospel message and receive complete forgiveness. Start life anew with a blank canvas. Do you struggle to forgive yourself in any way? What is standing in the way of you completely receiving God’s forgiveness? Are you still too hard on yourself? What would you say to a friend who is struggling with self-forgiveness? Is a load of guilt and shame. So let them go in Jesus name. Don’t bring them up again. Are We Supposed to Judge? Wikipedia defines judgment as, “the evaluation of evidence in the making of a decision.” Matthew 7:1 says, “Do not judge, or you too will be judged.” At first glance it would appear we should avoid all judgment. Even looking further in verses 3 – 5 we can see even more reason to avoid judging others. However, as we will see the Bible acknowledges judgment as necessary. Therefore, “do not judge” in Matthew 7 has to do with the motivations of the heart when judging, not an absolute prohibition. Judgment is a necessary part of life. God is Judge and all fair judgment begins with God. In 1 Corinthians 6:1-6, we find that God’s people will judge the world and angels. Right judgment is empowered by the Spirit. The Spirit gives wisdom and discernment. Solomon was the wisest person ever to live. He judged between many people. His succeeded because he had God’s gifting. Judgment brings order and maintains peace. We make judgments (discernments) all the time. It is what helps us make good decisions. We decide which job to take, which person to marry, which house to buy, etc. As parents we judge between siblings all the time. Godly discernment is a good thing. Bad judgment has sinful motives. A person giving bad judgment may do so to look better. A critical spirit is always wrong; it seeks the destruction of the other. One sign of bad judgment is that the person has not first considered how their judgment applies to their self. If this is done first, they will be more humble when seeking to correct a brother. I think this is why we are cautioned when restoring someone, so we don’t also fall into the same trap (see Galatians 6:1-10). If we don’t realize we have weaknesses we can be tempted and sin like the person we are helping restore. Bad judgment tears down. Good judgment restores, corrects, and builds up. Make judgments. But make them with your eyes wide open. Make judgments by the Holy Spirit. Keep in mind you might not be called to speak out your judgment. If you do, speak the truth in love. Why is judging a good thing? When is judging a bad thing? “Why do you look at the speck of sawdust in your brother’s eye and pay no attention to the plank in your own eye? How can you say to your brother, ‘Let me take the speck out of your eye,’ when all the time there is a plank in your own eye? You hypocrite, first take the plank out of your own eye, and then you will see clearly to remove the speck from your brother’s eye. “Do not give dogs what is sacred; do not throw your pearls to pigs. If you do, they may trample them under their feet, and turn and tear you to pieces. If any of you has a dispute with another, do you dare to take it before the ungodly for judgment instead of before the Lord’s people? Or do you not know that the Lord’s people will judge the world? And if you are to judge the world, are you not competent to judge trivial cases? Do you not know that we will judge angels? How much more the things of this life! Is Emotion an Obstacle or a Bridge? Are You Trying to Solve a Problem You Don’t Need to Solve? Darlene Harris on Is Emotion an Obstacle or a Bridge?